22inch led light bar Spot Flood Combo Beam + 2pcs 3INCH Cube Pods Fog lamp led work light all with RGB Halo Ring Color Change Chasing Strobeflash Controlled by RF remote controller The halo ring was installed inside the led light bar , which was protected by the lens, which can make it waterproof, come with wiring harness kit for RGB halo ring, RGB Halo Ring change color at the same time. 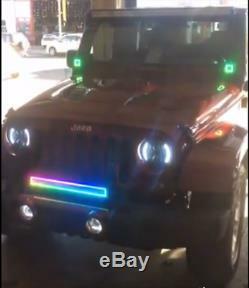 22inch led light bar Spot Flood Combo Beam Offroad Driving with Chasing RGB Halo RING. 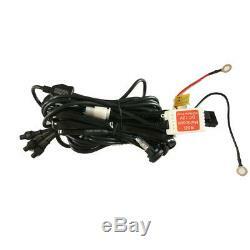 Operating Voltage: 9-16V DC 3. Waterproof rate: IP 67 4.40pcs3w high intensity LEDS chips 5. 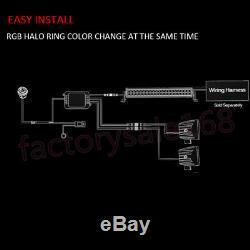 Light Color: White 6000k Angel Eeys Halo Ring : RGB Changeable 6. Material:Material: Hi-impact Aluminum Housing 7. Mounting Bracket: Stainless Mounting Hardware 9. Dimensions: 22 inch(Per Unit) 11. Beam Type: 30°Spot Beam & 60° Flood Combo 12. Theoretical Lumens Output: 12000LM 13. Size(without bracket): approx 22INCH 14. The high performance of tight waterproof, dustproof, quakeproof. 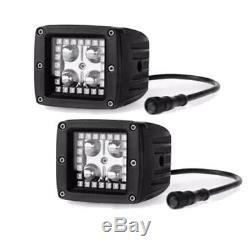 2pcs 3inch CREE led work light Square cube pods with RGB halo ring Chasing. Power: 16W Number of chips: 4pcs CREE chips Beam Angle: Spot beam 30 degree Led work light Color: White color 6000K Angel Eyes Halo Ring RGB Changeable Operating Voltage: DC 916V Material: Die-cast Aluminum Housing, Toughed Glass Cover Appearance: Black, Square Shape Size: Approx 3X3inch Operation Temperature -40°C 85°C Apply to car: front, rear Above 30,000 hours life time Waterproof Rate: IP67 Certified by CE and RoHs What is the different of our RGB halo ring chasing led light bar from other suppliers? 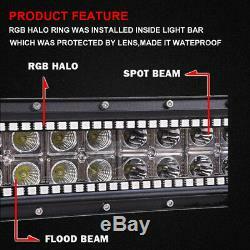 The halo ring was installed inside the led light bar , which was protected by the lens, and make it waterproof 2. 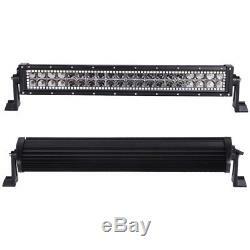 Insatlled with High Quality chips, it can light up 6000K White as regural led light bar, high brightness, long lifespan. The halo ring was installed inside the led light bar , which was protected by the lens, and make it waterproof 4. 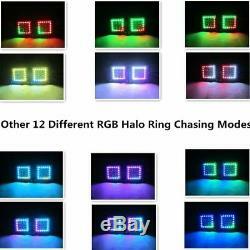 RGB halo ring color can be steady, constant, Color chasing , Flash, also can speed up and slow down. 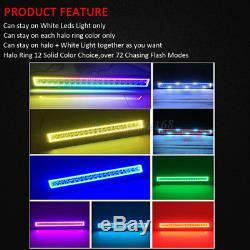 There are more than 72 different flashing modes, they can be red white chasing, green white chasing, blue white chasing, yellow white chasing, light blue white chasing, pink white chasing, red fading, green fading, blue fading, yellow fading, light blue fading, pink fading and white fading etc. Offroad vehicle, ATVs, truck, engineering vehicles excavator, treedozer, road roller, bulldozer, crane and mining truck etc. Special vehicle (fire engine, police cars, rescue vehicle, communication vehicle, military command vehicle) forklift, trains, boat, bus, and tanks. Work/Spot/Day/Fog lamp, Available in the auxiliary lamp for, SUVs bumper, fire engine, ambulance and car, Indoor & Outdoor uses. 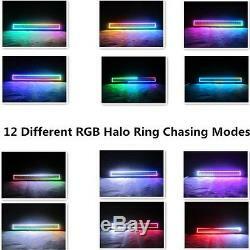 1pcs x 22inch straight led light bar with RGB halo ring 2pcs 3inch led work light with rgb halo ring 1set wiring harness kit with control box for RGB halo ring 1PC RF remote controller (without battery) Tested before sent Low Temperature Test High Temperature Test Temperature & Humidity Test Thermal Shock Cycling Test Dust Test Random Vibration Test Mechanical Shock Test Low Pressure Test Drip Box Water Test Clear & Consistent -Customized LEDensures only the highest consistency of LED color and brightness for our LED products. Our LED Lights start up quickly and efficiently with little battery draw. Built to Last - Our LED lights are made with only the highest grade materials available. Our manufacturing process ensures LED Lights that are resistant to water penetration, shock and vibration. Super Bright Led light bar. Multicolor Change installed RGB Angel Eyes Halo Ring. 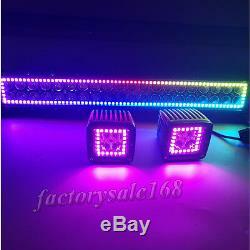 The item "22 LED Light Bar + 2x 3 CREE Cube Pods with RGB Halo MultiColor Chasing SUV" is in sale since Saturday, April 1, 2017. 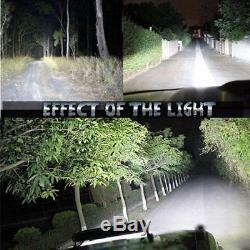 This item is in the category "eBay Motors\Parts & Accessories\Car & Truck Parts\Lighting & Lamps\Light Bars". 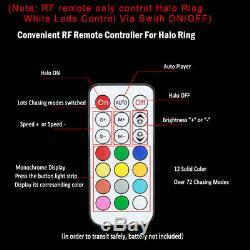 The seller is "factorysale168" and is located in Guangzhou. This item can be shipped worldwide.